PicRenameIt 3.1 - The fast and easy way to rename, renumber, and resize files. Rename files, renumber files, and resize files in one easy operation. Integrates with Windows Explorer (Microsoft's file manager). Resize files to preselected resolutions or custom resolutions while maintaining aspect ratios. Renumber files by file time, date picture taken, or alphabetical order. Works with all file types. Easy to use. PicRenameIt 3.1 - The fast and easy way to rename, renumber, and resize files. o Rename files, renumber files, and resize files in one easy operation. o Integrates with Windows Explorer (Microsoft's file manager). 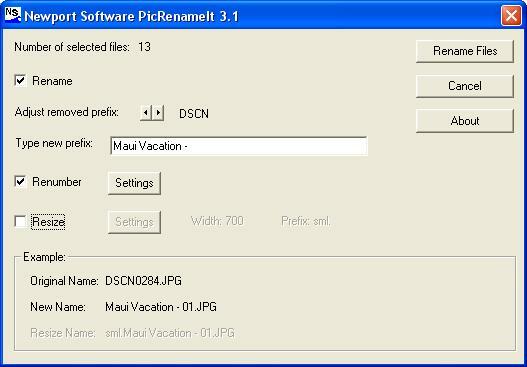 Simply right click on a list of files and select "Rename / Resize with PicRenameit". o Rename a single file or rename multiple files at one time. o Resize files to preselected resolutions or custom resolutions while maintaining aspect ratios. o Renumber files by file time, date picture taken, or alphabetical order. o Rename files, renumber files, and resize files at the same time. o Renumber files taken with multiple cameras and order pictures by the "Date Picture Taken" attribute. o Works with all file types. o Instant software delivery upon receipt of payment. Here is the solution that will save you time and frustration. Organize all of your pictures with ease. Rename your files, renumber your files, or resize your files in seconds with Newport Software's PicRenameIt 3.1. PicRenameIt integrates directly with the Windows Explorer. Simply start Windows Explorer, select the files you would like to rename, press the right mouse button, and select "Rename with PicRenameIt". PicRenameIt 3.1 includes file renumbering capability. Simply click on the "Renumber" check box to enable file renumbering. PicRenameIt will replace each of the existing file numbers with a new number in sequential order. PicRenameIt 3.1 resizes files as easily as it renames files.